Jetting off for some winter sun? Then you’ll be needing the Clarins Aftersun Range! 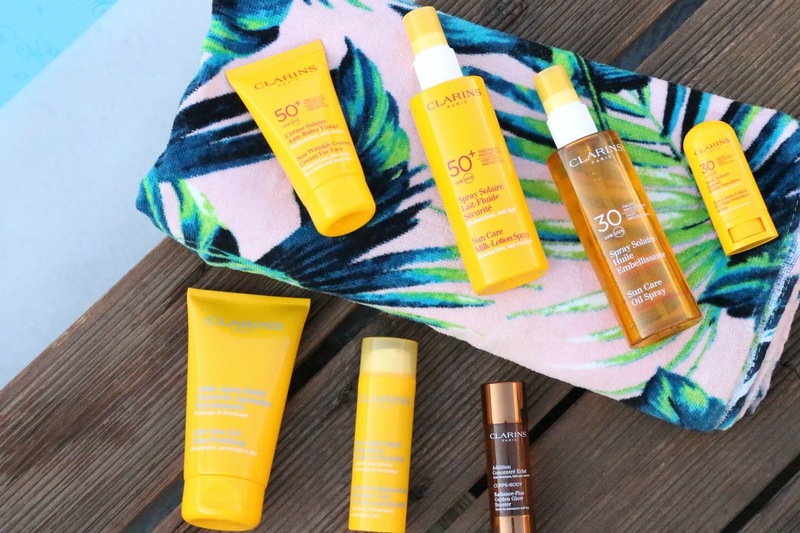 You might recall the post I blogged last month all about the Clarins SPF range well their range of aftersun products is just as fantastic. I’ve been using them for a long time now, my favourite being the Clarins After Sun Moisturiser Self Tanning which rehydrates the skin and intensifies a tan with a small amount of false tanning pigment within the lotion. It gives the skin a golden glow without making me feel as though I need to really hammer the sunbathing to get my tan up fast! 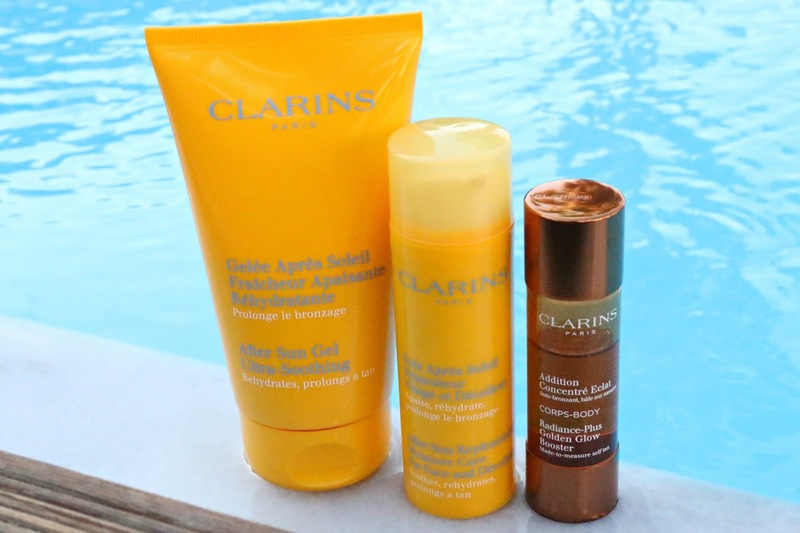 However this summer and autumn, I’ve been trying out a combination that’s new to me and that’s adding theClarins Radiance Plus Golden Glow Booster For Body into my aftersun products. This is a really genius self tanner that comes in a dropper bottle so that you can customise your tanning result; simply add 4 to 6 drops into your regular body lotion or aftersun in your palm, mix and apply as usual for a natural looking, made to measure tan. Adding more drops intensifies the bronzing effect and less understandably, gives you less of a golden glow. The effect is soft, gradual and my skin has never looked streaky using it. The result is really natural looking and I love that I can use these drops on holiday with my aftersun to have a similar effect to the Clarins After Sun Self Tanning that I’ve used and loved for a long time, or I can add them to my regular body moisturisers to reap the benefits of those with an added healthy glow. The Radiance Plus Golden Glow Booster is available for the face and the body but as far as I can see, the ingredients are the same. I bought the one for the body as the bottle was bigger and the cost difference meant that it was cheaper per ml (£27 for 30ml) overall than buying the face one (£20 for 15ml) either on its own or with the body booster and I use it in both my face creams and my body lotions. Since trying out the booster drops, I’ve dabbled with more of the Clarins after sun range and I’ve found a couple of absolute gems. The Clarins After Sun Gel Ultra-Soothing is a fantastic body product for soothing the skin when you’ve spent a day basking in the sun and prolonging a tan. I used my first bottle up on my trip to Bali and have since repurchased in the airport when I went away to Crete with my friends. It smoothes onto the skin effortlessly, cools as it absorbs, reduces redness and sinks in within a few minutes leaving my skin looking and feeling hydrated, soft and smooth. This after sun has the most fabulous formula that is cooling like a gel but quite dense like a cream. It contains refreshing watermelon extract and feels cooling on the skin; not in a cheap aloe vera aftersun way, this gel is soothing and nourishing on the body. It works quickly to rehydrate the skin, making it feel comfortable and deeply moisturised. Keeping your skin hydrated helps to prevent peeling and helps your tan to stay around for longer which lets face it, we all want! For the face, the Clarins After Sun Replenishing Moisture Care For Face and Décolleté is an absolute winner. Just like I’d always recommend using a separate SPF for the face and body, I’d suggest doing the same with your aftersun too as generally they contain different ingredients and a lot of things that are suitable for the skin on our body can clog the pores on our face. This Clarins face aftersun has the most gorgeous texture that’s somewhere between a lotion, a gel and a balm; not too dissimilar to the body aftersun I’ve reviewed above. Only one pump is needed as the bottle dispenses just the right amount of product for the full face and décolleté. It immediately soothes, hydrates and regenerates the skin using a combination of powerful ingredients including moisturising Shea, Centella Asiatica and Mimosa Tenuiflora. It also contains sunflower seed and aloe vera extract which cools and soothes the skin and reduces redness. I’m very conscious of premature skin ageing so using an aftersun like this one is important to me to help to repair the skin and reduce the appearance of fine lines, while protecting against free radicals that can remain active even after you’ve come out of the sunshine. I love to get a tan while I’m away on holiday but taking care of my skin has to always be the priority. 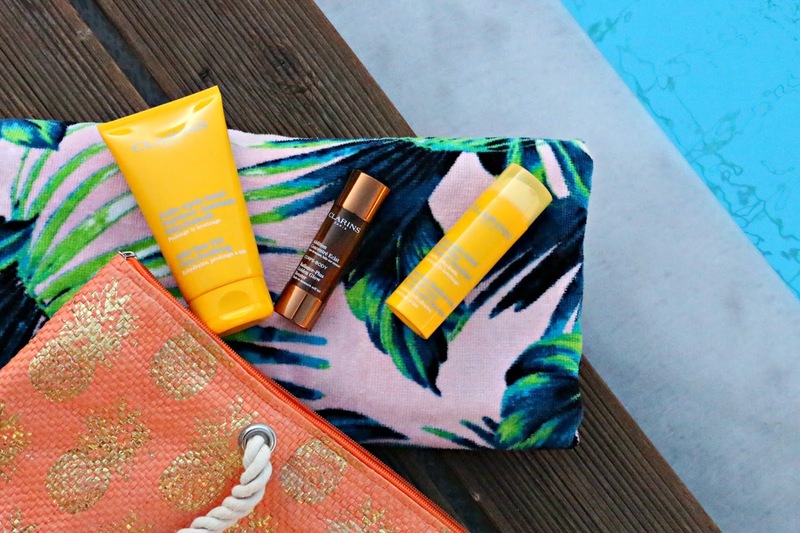 I love that with Clarins, I get the best of both worlds; fantastic sun protection and nourishing aftercare, resulting in a deep, long lasting tan without burning. What Clarins products do you love the most? What aftersun formulas do you like to use the most?